Reviewing this book is a huge aggravation to us, as so much of it has been derived from our groundbreaking work on the Thyssens, published a decade earlier, for which the author grants us not a single credit. It is surprising that Simone Derix does not have the respect for professional ethics to acknowledge our historiographic contribution; especially since she stated in a 2009 conference that non-academic works, whilst creating feelings of fear amongst academics of losing their prerogative to interpret history, are taking on increasing importance. Ms Derix herself is not the fearful type of course, though somewhat hypocritical. She appears to be preemptively obedient and committed to pleasing her presumably partisan paymasters, in the form of the Fritz Thyssen Foundation. Alas, she is clearly not the smartest person either; writing, for instance, that Heinrich Lübke, Director of the August Thyssen Bank (he died in 1962), was the same Heinrich Lübke who was President of Germany (in that position until 1969). But Ms Derix’s intellectual shortcomings are much more serious than simple factual errors, which should, in any case, have been picked up by at least one of her two associate writers, three project leaders, four academic mentors and six research assistants. She is in all seriousness trying to convince us that research into the lives of wealthy persons is a brand new branch of academia, and that she is its most illustrious, pioneering proponent. Does she not know that recorded history has traditionally been by the rich, of the rich and for the rich only? Has she forgotten that even basic reading and writing were privileges of the few until some hundred and fifty years ago? At the same time, contrary to us, Derix does not appear to have had any first hand experience of exceptionally rich people at all, particularly Thyssens. Her sponsorship, earlier in her studies, by the well-endowed Gerda Henkel Foundation, was presumably an equally ‘arm’s length’ relationship. Rich people only mix with rich people, and unless Derix got paid by the word, there is no evidence that she ever in any way qualified for serious comment on their modus operandi. What is new, of course, is that feudalism has been swept away and replaced by democratic societies, where knowledge is broadly accessible and equality before the law is paramount. Yes, her assertion that super-rich people’s archives are difficult to access is true. They only ever want you to know glorious things about them and keep the realities cloaked behind their outstanding wealth. To suggest that this series is being issued because the Thyssens have suddenly decided to engage in an exercise of honesty, generously letting official historians browse their most private documents, however, is ludicrous. The only reason why Simone Derix is revealing some controversial facts about the Thyssens is because we already revealed them. The difference is that she repackages our evidence in decidedly positive terms, so as to comply with the series’ overall damage limitation program. Thus, Derix seems to believe she can run with the fox and hunt with the hounds; a balancing act made considerably easier by her pronouncement, early on, that any considerations of ethics or morality are to be categorically excluded from her study. The fact that the Thyssens camouflaged their German companies (including those manufacturing weapons and using forced labour) behind international strawmen, with the benefit of facilitating the large-scale evasion of German taxes, is re-branded by Derix as being a misleading description ‘made from a state perspective’ and which ‘tried to establish a desired order rather than depict an already existing order’. As if ‘the state’, as we democrats understand it, is some kind of devious entity that needs fending off, rather than the collective support mechanism of all equal, law-abiding citizens. It is just one of the many statements that appears to show how much the arguably authoritarian mindset of her sponsors may have rubbed off on her. The fact that academics employed by publicly funded universities should be used thus as PR-agents for the self-serving entities that are the Fritz Thyssen Foundation, the Thyssen Industrial History Foundation and the ThyssenKrupp Konzern Archive is highly questionable by any standards, but particularly by supposedly academic ones. Especially when they claim to be independent. In Derix’s world, the Thyssens are still (!) mostly referred to as ‘victims’, ‘(tax) refugees’, ‘dispossessed’ and ‘disenfranchised’, even if she admits briefly, once or twice in 500 pages, that ‘in the long-term it seems that they were able always to secure their assets and keep them available for their own personal needs’. As far as the Thyssens’ involvement with National Socialism is concerned, she calls them ‘entangled’ in it, ‘related’ to it, being ‘present’ in it and ‘living in it’. With two or three exceptions they are never properly described as the active, profiting contributors to the existence and aims of the regime. Rather, as in volume 2 (‘Forced Labour at Thyssen’), the blame is again largely transferred to their managers. This is very convenient for the Thyssens, as the families of these men do not have the resources to finance counter-histories to clear their loved ones’ names. But for Simone Derix to say that ‘from the perspective of nation states these (Thyssen managers) had to appear to be hoodlums’ really oversteps the boundaries of fair comment. The outrageousnness of her allegation is compounded by the fact that she fails to quote evidence, as reproduced in our book, showing that allied investigators made clear reference to the Thyssens themselves being the real perpetrators and obfuscators. Yet still, Derix purports to be invoking German greatness, honour and patriotism in her quest for Thyssen gloss. She alleges bombastically that the mausoleum at Landsberg Castle in Mülheim-Kettwig ‘guarantees (the family’s) presence and attachment to the Ruhr’ and that there is an ‘indissoluble connection between the Thyssen family, their enterprises, the region and their catholic faith’. But she fails to properly range them alongside the industrialist families of Krupp, Quandt, Siemens and Bosch, preferring to surround their name hyperbolically with those of the Bismarck, Hohenzollern, Thurn und Taxis and Wittelsbach ruling dynasties. In reality, many Thyssen heirs chose to turn their backs on Germany and live transnational lives abroad. Their mausoleum is not even accessible to the general public. Contrary to what Derix implies, the iconic name that engenders such a strong feeling of allegiance in Germany is that of the public Thyssen (now ThyssenKrupp) company alone, as one of the main national employers. This has nothing whatsoever to do with any respect for the descendants of the formidable August Thyssen, most of whom are, for reason of their chosen absence, completely unknown in the country. In this context, it is indicative that Simone Derix categorises the Thyssens as ‘old money’, as well as ‘working rich people’. But while in the early 19th century Friedrich Thyssen was already a banker, it was only his sons August (75% share) and Josef (25% share), from 1871 onwards (and with the ensuing profits from the two world wars) who created through their relentless work, and that of their employees and workers, the enormous Thyssen fortune. Their equal was never seen again in subsequent Thyssen generations. Thus the Thyssens became ‘ultra-rich’ and were completely set apart from the established aristocratic-bourgeois upper class. They could hardly be called ‘old money’ and neither could their heirs, despite trying everything in their power to adopt the trappings of the aristocracy (which beggars the question why volume 6 of the series is called ‘Fritz and Heinrich Thyssen – Two bourgeois lives in the public eye’). This included marrying into the Hungarian, increasingly faux aristocracy, whereby, even Derix has to admit, by the 1920s every fifth Hungarian citizen pretended to be an aristocrat. The line of Bornemiszas, for instance, which Heinrich married into, were not the old ‘ruling dynastic line’ that Derix still pretends they were. The Thyssen-Bornemiszas came to be connected with the Dutch royals not because Heinrich’s wife Margit was such a (self-styled) ‘success’ at court, but because the Thyssens had important business interests in that country. 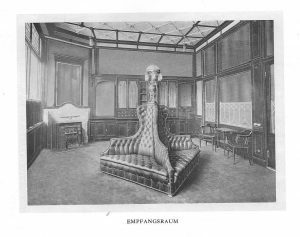 Thus Heinrich became a banker to the Dutch royal household, as well as a personal friend of Queen Wilhelmina’s husband Prince Hendrik. The truth is: apart from such money-orientated connections, neither the German nor the English or any other European nobility welcomed these parvenus into their immediate ranks (religion too played a role, of course, as the Thyssens were and are catholics). Until, that is, social conventions had moved on enough by the 1930s and their daughters were able to marry into the truly old Hungarian dynasties of Batthyany and Zichy. But until that time, based on their outstanding wealth, this did not stop the brothers from adopting many of the domains of grandeur for themselves. Fritz Thyssen, according to Derix, even spent his time in the early 1900s importing horses from England, introducing English fox hunting to Germany and owning a pack of staghounds. He also had his servant quarters built lower down from his own in his new country seat, specifically to signal class distinction. 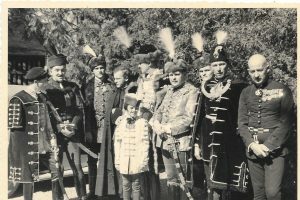 These are indeed remarkable new revelations showing that the traditional image put out by the Thyssen organisation of bad cop German, ‘temporarily’ fascist industrialist Fritz Thyssen, good cop Hungarian ‘nobleman’ Heinrich Thyssen-Bornemisza is even more misleading than we always thought. Truly lamentable are Derix’s attempts to portray Fritz Thyssen as a devout, christian peacenik and centrist party member. And so are her lengthy contortions in presenting Heinrich Thyssen-Bornemisza as the perfectly assimilated Hungarian country squire. She does, however, report that Heinrich’s wife had stated he did not speak a word of the language, which does not stop Felix de Taillez in volume 6 writing that he did speak Hungarian. ‘If you can’t beat them, confuse them’ was Heini Thyssen’s motto. Clearly, it has also become the motto of these Thyssen-financed academics. Meanwhile, Derix’s book is the first work supported by the Thyssen organisation to confirm that Heinrich Thyssen-Bornemisza did retain his German (then Prussian) citizenship. She also does venture to state that his adoption of the Hungarian nationality ‘might’ have been ‘strategic’. But these gems of truthfulness are swamped under the fountains of her gushing propaganda designed to make the second generation Thyssens look better than they were. This includes her development of August Junior’s role from black sheep of the family to committed businessman. On the other hand, the author still fails to explain any business-related details on the much more important Heinrich Thyssen’s life in England at the turn of the century (cues: banking and diplomacy). How exactly did the family come to be closely acquainted with the likes of Henry Mowbray Howard (British liaison officer at the French Naval Ministry) or Guy L’Estrange Ewen (special envoy to the British royals)? A huge chance of genuine transparency was wasted here. Derix also fails to draw attention to the fact that the August Thyssen and Josef Thyssen branches of the family developed in very different ways. August’s heirs exploited, left and betrayed Germany and were decidedly ‘nouveau riche’, except for Heinrich’s son Heini Thyssen-Bornemisza and his son Georg Thyssen, who really did involve themselves in the management of their companies. By contrast, Josef’s heirs Hans and Julius Thyssen stayed in Germany (respectively were prepared to return there in the 1930s from Switzerland when foreign exchange restrictions came into force), paid their taxes, worked in the Thyssen Konzern before selling out in the 1940s, pooling their resources and adopting careers in the professions. Only the Josef Thyssen side of the family is listed in the German Manager Magazine Rich List; but for unexplained reasons Derix leaves these truly ‘working rich’ Thyssens largely unmentioned in her book. Fortunately, Derix does not concentrate all her efforts in creative fiction and plagiarisation, but manages to provide at least some substantive politico-economic facts as well. So she reveals that Heinrich Thyssen-Bornemisza was a member of the supervisory board of the United Steelworks of Düsseldorf until 1933, i.e. until after Adolf Hitler’s assumption of power. This, combined with her statement that ‘Heinrich seems to have orientated himself towards Berlin on a permanent basis as early as 1927/8 (from Scheveningen in The Netherlands)’ pokes a hole in one of the major Thyssen convenience legends, that of Heinrich Thyssen-Bornemisza having had his main residence in neutral Switzerland from 1932 onwards (i.e. conveniently from before Hitler’ assumption of power; having ‘left Germany just in time’); though this does not stop Derix from subsequently repeating that fallacy just the same (- ‘If you can’t beat them, confuse them’-). Fact is that, despite buying Villa Favorita in Lugano, Switzerland in 1932, Heinrich Thyssen continued to spend the largest amounts of his time living a hotel life in a permanent suite in Berlin and elsewhere and also kept a main residence in Holland (where Heini Thyssen grew up almost alone, except for the staff). His Ticino lawyer Roberto van Aken had to remind him in 1936 that he still had not applied for permanent residency in Switzerland. It was not until November 1937 that Heinrich Thyssen and his wife Gunhilde received their Swiss foreigner passes (see ‘The Thyssen Art Macabre’, page 116). Derix also readjusts the old Thyssen myth that Fritz Thyssen and Heinrich Thyssen-Bornemisza went their separate ways in business as soon as they inherited from their father, who died in 1926. We always said that the two brothers remained strongly interlinked until well into the second half of the 20th century. And hey presto, here we have Simone Derix alleging now that ‘historians so far have always assumed that the separation had been concluded by 1936’. She adds ‘despite all attempts at separating the shares of Fritz Thyssen and Heinrich Thyssen-Bornemisza, the fortunes of Fritz and Heinrich remained interlocked (regulated contractually) well into the time after the second world war’. But it is her next sentence that most infuriates: ‘Obviously it was very difficult for outsiders to recognise this connection’. The truth of the matter is that the situation was opaque because the Thyssens and their organisation went to extraordinary lengths and did everything in their power to obfuscate matters, particularly as it meant hiding Fritz Thyssen’s and Heinrich Thyssen-Bornemisza’s joint involvement in supporting the Nazi regime. 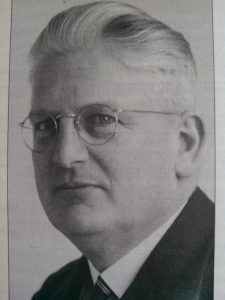 Amongst the Thyssens’ many advisors, the author introduces Dutchman Hendrik J Kouwenhoven as the main connecting link between the brothers, who ‘opened up opportunities and thought up financial instruments’. He worked from 1914 at the family’s Handels en Transport Maatschappij Vulcaan and then at their Bank voor Handel en Scheepvaart (BVHS) in Rotterdam from its official inception in 1918 to his sacking by Heinrich Thyssen-Bornemisza during the second world war. The asset management or trust company of BVHS was called Rotterdamsch Trustees Kantoor (RTK), which Derix describes as ‘repository for the finance capital of the Thyssen enterprises, as well as for the Thyssens’ private funds’. She does not say when it was created. ‘Its offices and all the important papers that Heinrich Thyssen-Bornemisza had lodged (at RTK) were all destroyed in a German aerial bombardment of Rotterdam on 14.05.1940’, according to Derix. To us this sounds like a highly suspicious piece of information. Of the files of BVHS she curtly says that ‘a complete set of source materials is not available’. How convenient, especially since no-one outside the Thyssen organisation will ever be able to verify this claim truly independently; or at least until the protective mantle of Professor Manfred Rasch, head of the ThyssenKrupp Konzern Archive, retires. Derix alludes to ‘the early internationalisation of the Thyssen Konzern from 1900’, ascribing her knowledge of its bases in raw material purchases and the implementation of a Thyssen-owned trading and transport network to Jörg Lesczenski, who published two years after us (and whose work, like that of Derix herself, was backed by the Fritz Thyssen Foundation). But she leaves cross-references aside concerning the first tax havens (including that of The Netherlands) which were set up in the outgoing 19th century, conveniently referring this area to ‘research that should be carried out in the future’. Derix names the 1906 Transportkontor Vulkan GmbH Duisburg-Hamborn with its Rotterdam branch (see above) and the 1913 Deutsch-Überseeische Handelsgesellschaft der Thyssenschen Werke mbH of Buenos Aires (by the way: to this day ThyssenKrupp AG is a major trader in raw materials). She also states that American loans to the Thyssen Konzern started in 1919 via the ‘Vulcaan Coal Company’ (failing to mention that this company was based in London). According to Derix, August Thyssen began transferring his shares in the Thyssen companies to his sons Fritz and Heinrich in 1919, first those of Thyssen & Co. and from 1921 onwards those of the August Thyssen smelting works. She then adds that existing Thyssen institutions outside of Germany were used in order to carry out this transfer. From 1920 onwards, Fritz Thyssen began to buy real estate in Argentina. 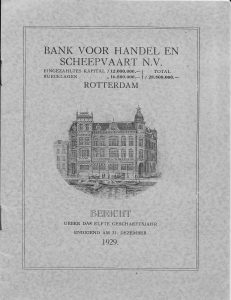 Meanwhile, the Thyssens’ Union Banking Corporation (UBC), founded in 1924 in the Harriman Building on New York’s Broadway, is described solely in the language of the ‘transnational dimension of the Thyssens’ financial network’ and as being ‘the American branch of the Bank voor Handel en Scheepvaart’. We had already detailed in our book how Heinrich Thyssen-Bornemisza, via Hendrik Kouwenhoven, set up in Switzerland the Kaszony Family Foundation in 1926 to lodge his inherited participations and the Rohoncz Collection Foundation in 1931 to place art works he bought as easily movable capital investments from 1928 onwards. Now Derix writes that the Rohoncz Foundation too was founded in 1926. This is astonishing, since it means that this entity was set up a whole two years prior to Heinrich Thyssen buying the first painting to find its way into what he called the ‘Rohoncz Castle Collection’ (despite the fact that none of the pictures ever went anywhere near his Hungarian, then Austrian castle, in which he had stopped living in 1919). The timing of the creation of this offshore instrument just proves how contrived Heinrich’s reinvention as a ‘fine art connaisseur and collector’ really was. Derix even freely admits that these Thyssen family foundations were ‘antagonists of states and governments’. However, just like Johannes Gramlich in volume 3 (‘The Thyssens as Art Collectors’), she too leaves the logistics of the transfer of some 500 paintings by Heinrich Thyssen-Bornemisza into Switzerland in the 1930s completely unmentioned, including the fact that this represented a method of massive capital flight out of Germany. The associated topics of tax evasion and tax avoidance stay completely off her academic radar; ignoring our documented proof. In another bold rewriting of official Thyssen history the author states that the Thyssen brothers frequently acted in parallel in their financial affairs. And so it was that the Pelzer Foundation and Faminta AG came to be created , by Kouwenhoven, in Switzerland, on behalf of Fritz Thyssen and his immediate family. (Derix is hazy about exact dates. We published: 1929 for Faminta AG and the late 1930s for the Pelzer Foundation). Derix points out that these two instruments also allowed secret transactions between the Thyssen brothers. She adds enigmatically that ‘Faminta protected the foreign assets of the August Thyssen smelting works from a possible confiscation by the German authorities’, whilst withholding any reference to a time scale of when such a confiscation might have been on the cards (is she suggesting a possibility prior to Fritz Thyssen’s flight in September 1939, i.e. anytime during the period 1929-1939?). At the same time, in the 1920s, Fritz and Amelie Thyssen established a firm base in the south of the German Reich, namely in Bavaria – far away from the Thyssen heartland of the Ruhr – which Derix brands as a fact which has ‘so far been almost completely ignored by historians’. Of course, not only was this most royalist of German states close to Switzerland, but it was also, at that time, the cradle of the Nazi movement. Adolf Hitler also much preferred Munich to Berlin. All the family’s financial instruments, meanwhile, continued to be administrated by Rotterdamsch Trustees Kantoor in The Netherlands. 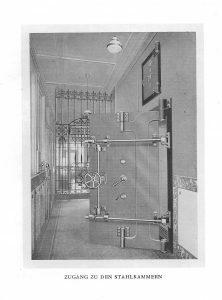 ‘These new Thyssen banks, companies, holdings and foundations created since the 1920s were connected to the Thyssen industrial enterprises (in Germany) through participations’, Derix continues. These enterprises etc. 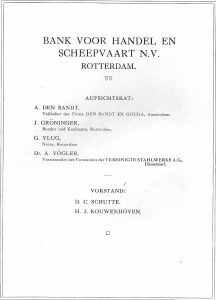 were also supportive of the rising Nazi movement of course, such as when their Bank voor Handel en Scheepvaart around 1930 demonstrably made a loan of some 350,000 RM to the Nazi party, at a time when both Fritz Thyssen and Heinrich Thyssen-Bornemisza had controlling interests in BVHS. 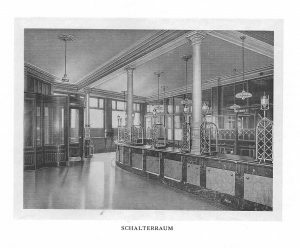 According to Derix, it was starting in 1930 that Heinrich Thyssen sold his shares in the United Steelworks to Fritz while Fritz sold his Dutch participations to Heinrich and as a result Heinrich Thyssen alone was in control of the Bank voor Handel en Scheepvaart from 1936 onwards. This is staggering, as the modern day equivalent is many hundreds of millions of Euros! Considering that Heinrich’s wife stated that he had taken some 200 million Swiss Francs of his assets into neutral countries, this would mean that, together, the Thyssen brothers possibly succeeded in extracting from Germany the cash equivalent of close to the complete monetary value of the Thyssen enterprises! This is not, however, a conclusion drawn by Simone Derix. One begins to wonder what there was actually left to confiscate from Fritz Thyssen once he fled Germany at the onset of war in 1939. Derix admits that his flight happened not least because he preferred to complete his self-interested financial transactions from the safety of Switzerland, with the help of Heinrich Blass at Credit Suisse in Zurich. Although we had managed to unearth several leads, we did not know that the real overall extent of the Thyssen brothers’ capital flight was quite this drastic. For Simone Derix to point this out on behalf of the Thyssen organisation is significant; even if she fails to draw any appropriate conclusions, as they would most likely be at odds with her blue-sky remit. Truly, and in the words of the far more experienced Harald Wixforth no less: for these ‘mega-capitalist(s) (…) the profit of their enterprises (i.e. their own) always assumed far greater priority than the public’s welfare’. Needless to say that we await Harald Wixforth’s and Boris Gehlen’s volumes on the Thyssen Bornemisza Group 1919-1932, respectively 1932-1947 with great interest. In this readjusted official light, Derix’s admission that Fritz and Amelie Thyssen’s ‘expropriation’ in late 1939 ‘did not directly result in any curtailment of their way of life’ no longer comes as any surprise. The author also finally reveals for the first time official departure details of Fritz Thyssen’s daughter Anita, her husband Gabor and their son Federico Zichy to Argentina. Apparently they travelled from Genua, sailing on 17.02.1940 on board the ship Conte Grande, bound for Buenos Aires. In order to provide her with befitting financial support, shares in Faminta AG had been transferred to the Übersee-Trust of Vaduz shortly beforehand, of which Anita Zichy-Thyssen, a Hungarian national, was the sole beneficiary. 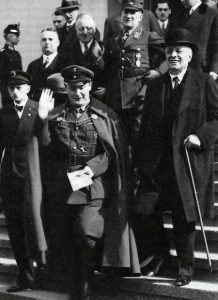 Derix then states that by April 1940, Fritz Thyssen ‘used his political knowledge on the German Reich and the German armaments industry as an asset that he could use in exchange for support for his personal wishes’. But what exactly were those wishes? The hubristically delusional Fritz obviously thought he could get rid of Hitler as easily as he had helped him get into power. For this, he was prepared to share German state secrets with French Foreign Minister Alexis Leger and Armament Minister Raoul Dautry in Paris. But for Derix, rather than being anything as contentious as active treason or an expression of power, his behaviour is nothing more than an ultra-rich man’s legitimate right to express his elevated lifestyle choices. While all previous Thyssen biographers, apart from us, have purported that Fritz and Amelie Thyssen suffered tremendous ‘excrutiations’ during their time in concentration camps, Derix confirms our information that they spent most of their German captivity in the comfortable, private sanatorium of Dr Sinn in Berlin-Neubabelsberg. She writes that they were kept there ‘on Hitler’s personal orders’ and ‘on trust’, though Fritz and Heinrich’s personal friend Hermann Göring, during his post-war allied interrogations, stated that their privileged treatment had been down to his initiative. After Neubabelsberg, they were taken to different concentration camps, but Derix is now forced to admit that they enjoyed ‘a special status’ which is retraceable ‘for each and every location’. Which makes one wonder, why German historians previously felt the need to misrepresent these facts. In July 1945 he was taken to Schloss Kransberg near Bad Nauheim, namely to the so-called ‘US/UK Dustbin Centre for scientists and industrialists’. In August, he went on to Kornwestheim before being taken, in September, to the 7th Army Interrogation Center in Augsburg. Derix also vagely asserts that Fritz Thyssen was interrogated at some point ‘in 1945’ by Robert Kempner, chief prosecutor of the Nuremberg trials. Thyssen suffered a collapse and had to go into medical care. He was taken to the US prisoners’ camp of Seckenheim, then to Oberursel. His health deteriorated. From April to November 1946 he went through various hospitals and convalescent homes between Königstein (where he made a surprise recovery) and Oberursel. From November 1946 onwards, he was at the Nuremberg follow-up trials as a witness (one presumes in the cases of Alfried Krupp and Friedrich Flick amongst others), while receiving continuous hospital treatment in Fürth. On 15.01.1947 Fritz Thyssen was released to join his wife Amelie in Bad Wiessee. This was followed by his German denazification proceedings in Königstein, where he and Amelie lived at the sanatorium of Dr Amelung. In that court, as befitting his insincere character, Fritz Thyssen described himself as penniless. Meanwhile, according to Derix, Anita Zichy-Thyssen made contact with Edmund Stinnes, who lived in the US and his brother-in-law Gero von Schulze-Gaevernitz, a close collaborator of US-secret service chief Allen Dulles. 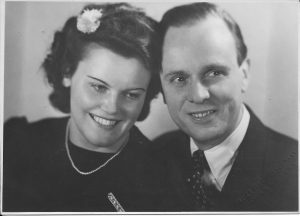 In the spring of 1947, ‘hoping to facilitate exit permits for her parents to go to America’, she met former US-senator Burton K Wheeler in Argentina, who travelled to Germany in 1948 ‘in order to help Fritz Thyssen out of his denazification problems’. It is certainly an aspect of high-level influence which we documented even more intensively, but which, astonishingly, Johannes Bähr in volume 5 (‘Thyssen in the Adenauer Period’) of the series has totally rejected. Another Thyssen who should have had problems with his denazification, but didn’t, was Heinrich’s son Stephan Thyssen-Bornemisza. While his brother Heini Thyssen went to the German school in The Hague, Stephan had boarded at the Lyceum Alpinum in Zuoz, Switzerland, where most pupils were from German speaking Switzerland, The Netherlands and the German Reich, respectively were Germans living abroad. Consequently, the school ran three houses named ‘Teutonia’, ‘Orania’ and ‘Helvetia’. After studying chemistry in Zurich and at the Massachusetts Institute of Technology, he became an assistant at a research laboratory of the Shell Petroleum Company in St Louis. He then wrote his dissertation at Budapest University and began working in natural resources deposit research. Since 1932, whilst living in Hanover, Stephan worked for Seismos GmbH, a prospecting company founded in 1921 by Deutsch-Lux, Phoenix, Hoesch, Rheinstahl and Gelsenkirchener Bergwerks AG. Derix writes: ‘From 1927 Gelsenkirchener, which belonged to the United Steelworks founded in 1926, was the main shareholder, holding 50% of the shares. This means Seismos came under Fritz Thyssen’s part of the family inheritance. (…) In the 1920s, prospecting groups of Seismos worked for oil companies such as Royal Dutch Shell or Roxana Petroleum in Texas, Louisiana and Mexico, looking for Oil. (…) Its radius then extended to the Near East, South-Eastern Europe and England’. In 1937, Seismos was bought for 1.5 million RM by Heinrich Thyssen and incorporated into his Thyssensche Gas- and Waterworks. During the war, according to Derix, the company was ‘involved in the exploitation of raw materials in the (Nazi) occupied territories (…) During their withdrawal from the Eastern Ukraine during the 1943 tank battle of Kursk they had to leave behind much equipment’. So, of no little importance for a company which so far, in Thyssen-backed histories, had been portrayed, if at all, as being of little consequence. And not for the secretive Heinrich Thyssen-Bornemisza either, whose son Heini Thyssen shortly after the war would get his Swiss lawyer Roberto van Aken to lie to the US visa application department thus: ‘From the advent of the Nazis’ rise to power, and particularly from 1938 onwards, Dr Heinrich Thyssen-Bornemisza’s (…) corporations were directed with the definitive purpose of minimising the Nazi armament efforts’ (The Thyssen Art Macabre, page 207). It is, if anything, in that same obfuscating spirit that Derix still conceals the fact that the Seismos company moved its headquarters from Hanover to the Harz mountains during the war, where the Nazis’ weapons of mass destruction program (V-rockets) would come to be based. Derix reveals that Stephan Thyssen-Bornemisza was a member of the Nazi Aircorps and confirms he was a contributing member of the SS. Nazi officials apparently declared Stephan Thyssen’s political stance to be ‘beyond all doubt’. But Derix cannot bring herself to even mention, let alone detail his additional involvement with another company, namely Maschinen- und Apparatebau AG (MABAG) of Nordhausen, also in the Harz. We had already established that Stephan Thyssen had become chairman of the supervisory board of MABAG in the early years of the war. This company, in conjunction with IG Farben, ‘had built a vast network of caves and tunnels in the Kohnstein mountain near Nordhausen equipped with tanks and pumps (…). From Februar 1942, Armaments and Munitions Minister Albert Speer recommended all possible support for the development of rockets. This represented massively ambitious armaments manufacturing plans and a great deal more work for MABAG, who, under the control of the Wehrmacht, were now also producing turbo fuel pumps for V-rockets’ (The Thyssen Art Macabre, page 160). ‘In 1940, the Deutsche Petroleum Konzern, following a change in their management, divested itself of all its works which did not fit into their framework of petroleum and coal extraction, including MABAG. Deutsche Bank negotiated the transfer of the share capital of 1 million Reichsmark into various hands. The majority was acquired by the solicitor and notary Paul Langkopf of Hanover (590,000 RM), which was most likely done on the orders of a client who wished to remain anonymous. Smaller share parcels were held by the Deutsche Bank in Leipzig (158,000 RM) and in Nordhausen (14,000 RM) as well as by Stephan Thyssen-Bornemisza in Hanover (50,000 RM). 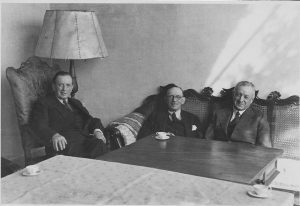 On 14.09.1940 MABAG elected its new supervisory board: Director Schirner, Paul Langkopf, Stephan Thyssen-Bornemisza and the Leipzig bank director Gustav Köllmann. (MABAG came to see itself as a company entirely geared to the production of armaments, …..including grenades, grenade launchers …….and turbo pumps for the A4-rockets)’. It just so happens that Paul Langkopf was a professional whose services had been engaged by various members of the Thyssen family over the years. It can be presumed with near certainty that the ‘anonymous’ shareholder was Heinrich Thyssen-Bornemisza. The secrecy of the transaction fits his style completely. And while Baranowski’s and our views on the use of forced labour by MABAG differ, his evidence is another indication towards the fact that Heinrich was definitely 100% pro-Nazi during the war, even while he was apparently retiring from the world, far away in his Swiss safehaven, pretending to have nothing to do with anything. The great Simone Derix, meanwhile, prefers to concentrate on relatively trivial revelations such as the fact that Stephan’s mother Margit also lived in Switzerland with her second husband, the ‘germanophile’, ‘antisemitic’ Janos Wettstein von Westersheimb, who lost his job at the Hungarian embassy in Berne when the war turned in 1943. Apparently, she lobbied ‘for Stephan to be allowed out of Germany (after the war) via Heinrich Rothmund, who during the war had been responsible in large parts for the anti-Jewish asylum policies of Switzerland’. Finally Simone Derix covers two other important topics in her book – as did we, albeit to a different degree -; namely: 1.) The Thyssens’ pre-war London gold deposits and their fate during, respectively after the war and 2.) 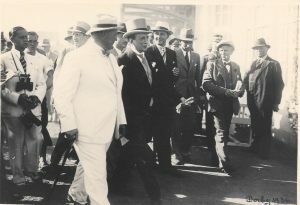 the removal of the Thyssens’ and Dutch royals’ share certificates from the Bank voor Handel en Scheepvaart in Rotterdam to the August Thyssen Bank in Berlin during the war, and their return to Rotterdam after the war, through an illegal act by a Dutch Military Mission, code named ‘Operation Juliana’. We will analyse the coverage of those topics more adequately in our reviews of Jan Schleusener’s, Harald Wixforth’s and Boris Gehlen’s forthcoming volumes. In both matters, members and associates of the Thyssen family played questionable roles, using their high-level (diplomatic and other) positions, to help the Thyssens play off one host nation against another, in their pursuit of limitless personal advantage. Simone Derix only takes her critical analysis as far as to say that these interferences allowed smaller states such as The Netherlands or Switzerland to pressurise victorious powers of the second world war in order to safeguard their own national interests in the Thyssens’ fortune. While our book has been called a possible ‘handbook for revolution’, Derix describes hers as ‘a model showing the way concerning the central, investigative strands for a history of the infrastructures of wealth’. She evokes the driving forces of ‘jealousy’ à la Ralf Dahrendorf, by the general public towards the super-rich, while ignoring the concept of ‘anger’ at their selfish sense of perennial legal immunity, as described by many such as Tom Wohlfahrt. Simone Derix’s writing style is very clear and during her book presentation at the Historisches Kolleg in Munich, the suave voice of the specially engaged Bavarian Radio reader made the passages sound like high literature, marinated in integrity. However, this academic, who was introduced to the audience by Professor Margit Szöllösi-Janze as ‘elite researcher’, definitely arrogates to herself a greater authority in broadcasting historical judgements than she is currently entitled to. At the subsequent podium conversation with the historian and journalist Dr Joachim Käppner of the Süddeutsche Zeitung, Derix rejected the concepts of power and of guilt unequivocally on behalf of the Thyssen family. In doing so, however, she had to be coaxed by Käppner repeatedly to focus her extremely hesitant flow of answers, which gave every impression, nevertheless, of having been pre-agreed. Let’s hope Simone Derix does not remain the only contributor of the series to formulate answers to these important questions – But with more honesty, hopefully, if not greater independence from the questionable role of the Fritz Thyssen Foundation.